The ubiquitous occurrence of microplastics (MPs) in the marine environment is raising concern for interactions with marine organisms. These particles efficiently adsorb persistent organic pollutants from surrounding environment and, due to the small size, they are easily available for ingestion at all trophic levels. Once ingested, MPs can induce mechanical damage, sub-lethal effects, and various cellular responses, further modulated by possible release of adsorbed chemicals or additives. In this study, ecotoxicological effects of MPs and their interactions with benzo(a)pyrene (BaP), chosen as a model compound for polycyclic aromatic hydrocarbons (PAHs) were investigated in Mediterranean mussels, Mytilus galloprovincialis. Organisms were exposed for 4 weeks to 10 mg/L of low-density polyethylene (LDPE) microparticles (2.34 * 107 particles/L, size range 20–25 μm), both virgin and pre-contaminated with BaP (15 μg/g). Organisms were also exposed for comparison to BaP dosed alone at 150 ng/L, corresponding to the amount adsorbed on microplastics. Tissue localization of microplastics was histologically evaluated; chemical analyses and a wide battery of biomarkers covering molecular, biochemical and cellular levels allowed to evaluate BaP bioaccumulation, alterations of immune system, antioxidant defenses, onset of oxidative stress, peroxisomal proliferation, genotoxicity, and neurotoxicity. Obtained data were elaborated within a quantitative weight of evidence (WOE) model which, using weighted criteria, provided synthetic hazard indices, for both chemical and cellular results, before their integration in a combined index. Microplastics were localized in hemolymph, gills, and especially digestive tissues where a potential transfer of BaP from MPs was also observed. Significant alterations were measured on the immune system, while more limited effects occurred on the oxidative status, neurotoxicity, and genotoxicity, with a different susceptibility of analyzed pathways, depending on tissue, time, and typology of exposure. Molecular analyses confirmed the general lack of significant transcriptional variations of antioxidant and stress genes. The overall results suggest that microplastics induce a slight cellular toxicity under short-term (28 days) exposure conditions. However, modulation of immune responses, along with bioaccumulation of BaP, pose the still unexplored risk that these particles, under conditions of more chronic exposure (months to years) or interacting with other stressors, may provoke long-term, subtle effects on organisms' health status. Microplastics are particles smaller than 5 mm in diameter (NOAA, 2015), now identified as the predominant component of plastic debris in the marine environment (Goldstein et al., 2013; Eriksen et al., 2014). The huge amount of microplastics documented over the past decade (Wright et al., 2013), is partly due to the direct release of micro-debris into the ocean (Browne, 2015), but in larger quantities, it depends on fragmentation of macro- and meso-plastic (Galgani et al., 2015; Thompson, 2015). The small dimensions of microplastics and their ubiquitous presence in marine habitats, are key factors promoting their interactions with organisms (Wright et al., 2013). Ingestion of microplastics is well-documented for several marine vertebrates and invertebrates, including commercially important species, which differ by trophic level, feeding strategies, and distribution along the water column (Lusher, 2015; Phuong et al., 2016; Avio et al., 2017a; Lusher et al., 2017; Santillo et al., 2017). Several laboratory experiments have been performed, in recent years, to understand dynamics of particles uptake, bioaccumulation and toxicological mechanisms possibly leading to detrimental effects in a variety of bioindicators organisms (Lusher, 2015; Phuong et al., 2016). Such studies demonstrated that ingested microplastics can be taken up into the cells by endocytosis, retained and even traslocated to different tissues (Browne et al., 2008; Von Moos et al., 2012; Avio et al., 2015). Several effects have been described in terms of histological alterations, inflammatory reactions, and ecotoxicological responses at cellular, biochemical, and molecular levels, but also in terms of modulations of physiological functions such as respiration, nutrition, reproduction and growth (Avio et al., 2015; Paul-Pont et al., 2016; Pedà et al., 2016; Détrée and Gallardo-Escárate, 2017; Karami et al., 2017). Harmful consequences of microplastics to marine organisms may also derive from the possible transfer of hazardous chemicals associated to the plastic during manufacturing or adsorbed from the environment (Rochman et al., 2013; Wright et al., 2013). In this respect, microplastics can efficiently concentrate organic pollutants from surrounding seawater, due to the hydrophobic nature of these compounds and to the high surface/volume ratio of the small particles (Liu et al., 2016), with a sorption capacity that varies by plastic polymers and considered chemicals (Rochman, 2015). Although the ingestion of microplastics does not certainly represent the main route of exposure to organic xenobiotics for aquatic animals, when compared with other environmental sources (i.e., water, sediments, food web) (Koelmans et al., 2016; Lohmann, 2017; Wang and Wang, 2018), plastic particles have the peculiar characteristic to combine a physical stress with a chemical challenge (Rochman, 2015). In this respect, studies addressing the ecotoxicological risk of microplastics in the marine environment, should consider both the individual effects of particles and chemicals, as well as their interactions, possibly causing synergistic, additive, or antagonistic effects (Syberg et al., 2015). While in field conditions it is virtually impossible to distinguish adverse effects caused by exposure to microplastics, chemicals, or their combined effects, controlled laboratory experiments remain a necessary approach to understand such mechanisms of toxicological action. In the present study, the contribution of microplastics to benzo(a)pyrene (BaP) bioavailability and the onset of adverse effects caused by pristine and contaminated particles were evaluated at cellular, biochemical, and transcriptional levels, using mussels Mytilus galloprovincialis, as biological model. These organisms have high ecological and commercial relevance in the Mediterranean Sea, where microplastics contamination is also of particular concern (Lusher, 2015). Organisms were exposed for 4 weeks to 10 mg/L of virgin low density polyethylene (LDPE) microparticles, one of the most common polymers in floating debris (Cózar et al., 2015; Suaria et al., 2016), BaP chosen as representative compound for polycyclic aromatic hydrocarbons (PAHs), and to BaP pre-treated particles (LDPE-BaP). Selected levels of microplastics are at least two orders of magnitude higher than those observed in the Mediterranean (Suaria et al., 2016) and more similar to those of the Californian Current System (5.33 mg/L, Gilfillan et al., 2009) and of North Pacific Central Gyre (3.02 mg/L, Moore et al., 2001; Sussarellu et al., 2016). The high dose of microplastics was chosen in our study to explore potential long-term mechanism of action of these particles after 28 days of exposure. 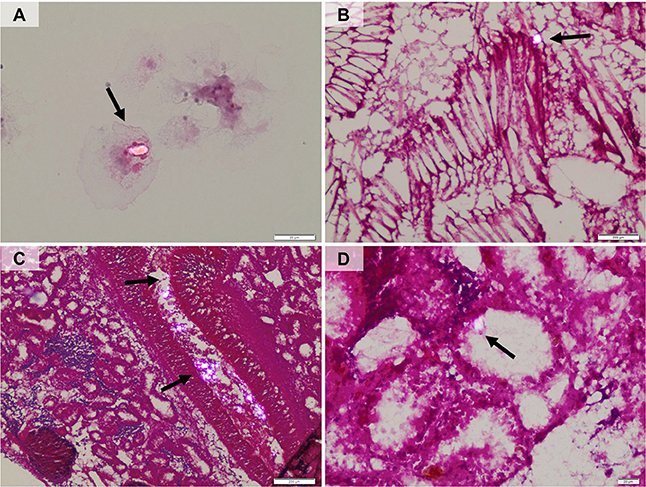 Chemical analyses of BaP and histological examinations were performed in digestive glands, gills, and hemolymph to confirm microplastics ingestion, translocation, and bioaccumulation in different tissues. A wide battery of biomarkers was measured at both cellular and transcriptional levels including lysosomal, immunological, and antioxidant responses, markers of neuro and genotoxicity, peroxisomal proliferation, lipid peroxidation, and oxidative stress. Results were further elaborated and integrated within a weight of evidence (WOE) model which provided a quantitative evaluation of hazard based on the extent of BaP accumulation, as well as on the toxicological relevance and magnitude of variations observed at cellular level. Overall, the study was expected to provide additional insights on potential ecotoxicological risk of microplastics and their role in transferring chemical pollutants to marine biota. Low density polyethylene (LDPE) particles (20–25 μm) were purchased from Micro Powders, Inc. (USA), while BaP was obtained from Sigma-Aldrich. The adsorption of BaP on LDPE was obtained mixing 4 g of LDPE micropowder in 32 ml of double-deionized water, spiked with 80 μl of BaP stock solution (1 μg/μL of BaP in toluene, purity 96%, SOLVECO). After 2 days in continuous rotation at the lowest speed (20 rpm, in 40 ml amber glass vials with Teflon lids), the solution was filtered on glass microfiber filters, rinsed with double-deionized water and dried by vacuum evaporation to obtain contaminated microplastic debris. To confirm the adsorption of BaP on microplastics, an aliquot of 0.25 g treated-LDPE was extracted in 2.5 mL of hexane, ultra-sonicated for 30 min, and centrifugated for 10 min. Supernatant was reduced to a volume of 1.5 ml using a nitrogen stream; 500 μL toluene were added and the volume further reduced to 500 μL. GC vials were filled with 100 ng recovery standard perylene D12 (Chiron) (2 ng/μL in toluene, 50 μL added) and 500 μL of extract transferred. Concentrations of BaP were quantified using a high-resolution GC-MS system (Micromass Autopspec Ultima), separation on a 30 m (0.25 mm i.d., 25 μm film thickness) DB-5MS column (J&W Scientific, Folsom, USA). Quality assurance/quality control procedures included the internal standard method using labeled standards. Reference microplastic (virgin microplastic) was tested in triplicates, spiked with internal standard solutions before extraction, and spiked with recovery standard before GC/MS-analysis. BaP was quantified by use of five points calibration curves. Relative standard deviation (RSD) of the triplicates was <15%. Quantification standards were analyzed after every 10 or 12 sample. Procedure blanks were included in all batches, the limit of detection (LOD) was defined as mean concentration in blanks +3 times the standard deviations. The absorbed concentration resulted approximately 15 μg BaP/g of LDPE. Specimens of M. galloprovincialis (6 ± 1 cm shell length) were obtained in March 2017 from a local farm in an unpolluted area of Central Adriatic Sea (Ancona) and acclimated for 15 days to laboratory conditions in glass aquaria with aerated artificial seawater (ASW; Instant Ocean® at salinity 37 p.s.u. and 18 ± 1°C. A total of 720 organisms were randomly distributed into twelve 20 L- glass-aquaria and exposed, in triplicates, to one of the following conditions for 4 weeks: (1) control (CTRL); (2) virgin LDPE (10 mg/L corresponding to 2.34 * 107 particles/L); (3) BaP alone (150 ng/L); (4) BaP-treated polyethylene (LDPE-BaP) (15 μg BaP/g LDPE). BaP was dissolved in acetone which had a final concentration of 0.0015%, previously shown to have no effects on exposed organisms (Giannapas et al., 2012; Grintzalis et al., 2012; Avio et al., 2015). The microplastics concentration (10 mg/l) is much lower than those used in previous exposures to mussels (Von Moos et al., 2012; Wegner et al., 2012; Avio et al., 2015), but still higher than the maximum levels detected in the Mediterranean Sea (0.026 mg/L) (Suaria et al., 2016). Although in the range of levels measured in California Current System and North Pacific Central Gyre (Gilfillan et al., 2009; Sussarellu et al., 2016), it was chosen to highlight the possible onset of long-term effects after 28 days of exposure. The administered dose of BaP (150 ng/l) was based on the amount of BaP adsorbed on microplastics and it also represents an environmentally realistic value, lower than those frequently used to assess ecotoxicological effects of BaP in marine invertebrates (Marigómez and Baybay-Villacorta, 2003; Pan et al., 2009; Ren et al., 2015; Banni et al., 2017; Rey-Salgueiro et al., 2017). Water was daily changed in each tank and virgin, pre-treated microplastics and BaP redosed. Mussels were fed 12 h prior the water change with a commercial mixture of zooplankton (50–300 μm) for filter-feeding organisms, and no mortality was observed during the experiment. To avoid the stratification of particles in the surface of the aquaria, air bubbling and motion pumps were used (Coral®, 250lt/h). Organisms were collected after 7, 14, and 28 days of exposure. Hemolymph, digestive glands and gills were rapidly removed from 60 specimens (20 from each tank) for each treatment, pooled in 20 samples (each containing tissues of three specimens), frozen in liquid nitrogen and maintained at −80°C for chemical, biochemical, molecular, and histochemical analyses. An aliquot of hemolymph was immediately processed for lysosomal neutral red retention time assay (NRRT), phagocytosis activity, granulocytes/hyalinocytes ratio, and DNA damage (Comet Assay), while another aliquot was fixed in Carnoy's solution (3:1 methanol, acetic acid) for the microscopic evaluation of micronuclei frequency. Benzo(a)pyrene in mussels digestive glands and gills was analyzed in samples extracted in 0.5 M potassium hydroxide and methanol (1:10 w:v) with microwave at 55°C for 15 min (Benedetti et al., 2014). Centrifugation was performed for 5 min at 1,000 × g, and resulting methanolic solutions, concentrated in speedvac, were finally purified with solid phase extraction (Octadecyl C18, 500 mg × 6 mL, Bakerbond). A final volume of 1 mL was recovered with pure, analytical HPLC gradient grade acetonitrile, before analyses were performed with water–acetonitrile gradient and fluorimetric detection. Appropriate pure standard solutions (EPA 610 Polynuclear Aromatic Hydrocarbons Mix) were used to identify BaP by the retention time. Quality assurance and quality control (QA/QC) included processing blank and reference samples (mussel tissues SRM 2977, NIST); concentrations obtained for the SRM were always within the 95% confidence interval of certified value. The water content in tissues was determined and concentrations of BaP expressed as ng/g dry weight (d.w.). Presence and histological localization of plastic particles were evaluated in cryostatic sections (20 μm thick) of gills and digestive glands, and in hemolymph smears. After staining with Haematoxylin and Eosin, slides were observed through polarized light microscopy. No quantitative assessment was performed and results on microplastics in tissues are thus of descriptive and qualitative nature. Standardized protocols were used for measurement of biomarkers in tissues of control and exposed organisms (Regoli and Winston, 1998; Bocchetti et al., 2008; Baršiene et al., 2012; Gorbi et al., 2013; Benedetti et al., 2014). Detailed methods have been given elsewhere (Avio et al., 2015) for the following typologies of effects: immunological alterations of hemocytes in terms of lysosomal membrane stability (NRRT), phagocytosis activity and granulocytes/hyalinocytes ratio (G/H ratio); neurotoxic responses in hemocytes and gills measured as enzymatic activity of acetylcholinesterase (AChE); cellular and oxidative stress biomarkers in digestive tissues, i.e., acyl-CoA oxidase (AOX), antioxidant defenses (catalase glutathione S-transferases, glutathione peroxidases, glutathione reductase, glutathione), total oxyradical scavenging capacity (TOSC), content of malondialdehyde (MDA), and neutral lipids (NL); genotoxic effects in hemolymph measured as DNA strand breaks and micronuclei frequency (MN). Transcriptional responses were measured in digestive glands for some antioxidant and stress genes including catalase (cat), glutathione peroxidase Se-dependent isoform (Se-gpx), glutathione S-transferase pi-isoform (gstpi), acyl CoA oxidase 1 (aox1), heat shock protein 70 (hsp70). Selected genes reflect at molecular level some of the responses also measured at the functional, catalytic level, and they are all typical responses to cellular stress. For mRNA isolation and cDNA synthesis, total RNA was purified from tissues using the Hybrid-R™ purification kit (GeneAll®), according to the manufacturer's protocol. Total RNA concentrations were measured by Nano-Drop ND-1000 UV-Visible Spectrophotometer (NanoDrop Technologies, Wilmington, DE, USA). RNA quality was verified on agarose-formaldehyde gel. Total cDNA was generated by RT-PCR (Reverse Transcription-Polymerase Chain Reaction) from 1 μg of total RNA for each sample using combined oligo(dT) and random hexamer primers (iScript cDNA Synthesis Kit, Bio-Rad). Absolute quantitative real-time PCRs (qPCRs) were performed with gene-specific primer pairs (Table 1) and mRNA levels of individual target genes were quantified through the SYBR green method in StepOnePlus® Real-Time PCR System (Applied Biosystems). Each 15 μl DNA amplification reaction contained 7.5 μl of SYBR Select Master Mix (Life Technologies), 5 μl of total cDNA (synthesized as described above and diluted 1:5), and 200 nM of each forward and reverse primers. The real-time PCR program included an enzyme activation step at 95°C (2 min) and 40 cycles each composed by 15 s at 95°C, 15 s at the annealing temperature (Table 1), and 1 min at 72 °C. The absence of a specific amplifications was checked by including negative controls lacking cDNA template and by a melting analysis (1 min at 95°C, 10 s at 65°C, and fluorescence detection at increasing temperature between 65 and 95°C). Table 1. 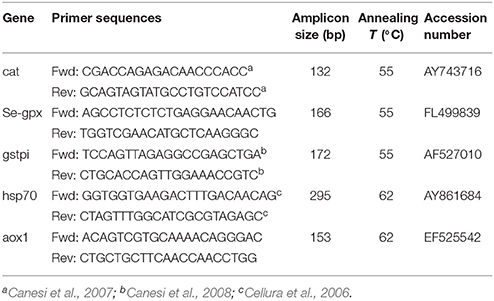 Primer pair sequences, amplicon size, annealing temperatures, and Genbank accession numbers of genes analyzed in quantitative PCR in the digestive gland of mussels. For each target gene, serial dilutions of known amounts of plasmid containing the amplicon of interest were used as standards. Samples and standards were run in duplicate in the same run. A calibration curve was built by plotting cycle threshold (Ct)-values vs. log copy numbers. Ct-values of unknown samples were converted into mRNA copy number by interpolating the standard plot. Obtained data from the same experimental group (n = 4) were averaged and expressed as mRNA copy number per μg of total RNA. Analysis of variance (Two-way ANOVA) was used to evaluate the effects of various treatments, time of exposure and their interactions on investigated parameters. Combined effects of microplastics and BaP were further assessed by post-hoc comparisons (Newman-Keuls) between LDPE, BaP, and LDPE-BaP. Level of significance was set at p < 0.05, homogeneity of variance was checked by Cochram C and mathematical transformation applied if necessary. Multivariate statistical analyses (principal component analysis, PCA) were applied to biomarkers data in order to discriminate between different exposure conditions; a threshold factor loading of 0.6 was used as cut-off value. A quantitative and software-assisted WOE model (Sediqualsoft) was applied to elaborate results of BaP bioavailability and biomarkers analyses and to summarize specific hazard indices. Whole calculations, detailed flow-charts, rationale for weights, thresholds, and expert judgments have been fully given elsewhere (Piva et al., 2011; Benedetti et al., 2012) and successfully applied to several multidisciplinary studies (Piva et al., 2011; Benedetti et al., 2012, 2014, 2016; Regoli et al., 2014; Avio et al., 2015; Bebianno et al., 2015; Mezzelani et al., 2016; Nardi et al., 2017). Briefly, the elaboration of Hazard Quozient for bioavailability (HQBA) was calculated by the increase of BaP tissue concentration in exposed organisms in respect to controls, corrected for the significance of the difference and assigned to one of five classes of effect, Absent (no increase compared to control concentrations), Slight (up to 2.6-folds increase), Moderate (up to 6.5-folds increase), Major (up to 13-folds increase), Severe (more than 13-folds increase, Piva et al., 2011). 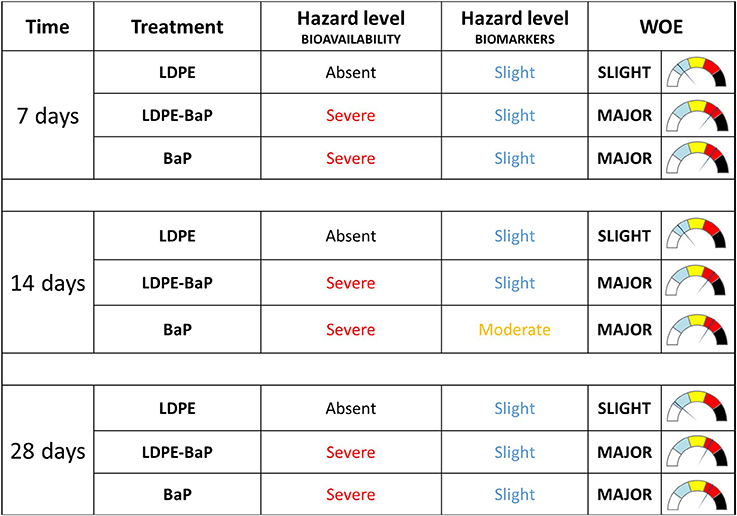 The level of cumulative HQBM is summarized in one of five classes of hazard for biomarkers, from Absent to Severe (Piva et al., 2011). The hazard indices elaborated for bioavailability and biomarker results are normalized to a common scale and finally integrated within a classical WOE approach which assigns one of five classes of risk, from Absent to Severe (Piva et al., 2011). Chemical analyses revealed a marked bioaccumulation in mussels exposed to either BaP alone or LDPE-BaP, in both digestive gland and gills (Figures 1A,B, Table 2). After 7 days of exposure, levels of BaP in the digestive glands were significantly enhanced, then remaining almost constant until the end of exposure and without significant differences as a function of time in organisms exposed to contaminated microplastics or to BaP alone (Figure 1A, Table 2). Gills exhibited rapid accumulation of BaP in organisms exposed to the chemical alone where the elevated concentration measured after 7 days did not further change (Figure 1B). On the other hand, in gills of mussels treated with contaminated microplastics, BaP levels significantly increased until the end of exposure at 28 days when values were similar to those of BaP treatment (Figure 1B, Table 2). Figure 1. Concentrations of benzo(a)pyrene in digestive glands (A) and gills (B) of mussels exposed for 7, 14, and 28 days to various treatments (CTRL, control; LDPE, virgin low density polyethylene; BaP, benzo(a)pyrene alone; LDPE-BaP, benzo(a)pyrene-contaminated polyethylene). Data are expressed as ng/g dry weight (mean values ± standard error, n = 4); different letters indicate significant differences between groups of means within the same time of exposure (post-hoc Newman-Keuls comparison). Table 2. 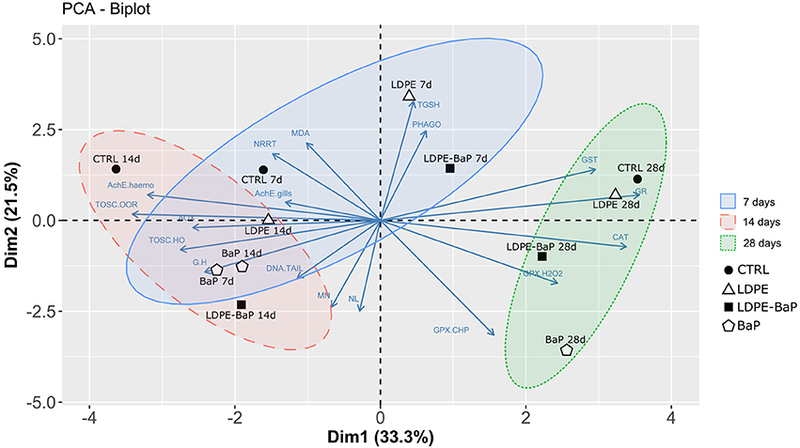 Results of two-way analysis of variance for the biological responses in mussels, M. galloprovincialis, exposed to different treatments (LDPE, BaP, and LDPE-BaP) for different times (7, 14, and 28 days). Histological analyses revealed the presence of microparticles in hemolymph, gills and digestive glands and no qualitative differences were observed between organisms treated with virgin LDPE or contaminated LDPE-BaP, as well as between different times of exposure (7, 14, and 28 days). Particles were observed inside hemocytic cells (Figure 2A), in the lamellae of gills (Figure 2B) and in digestive glands, where numerous aggregates could be observed in the intestinal lumen (Figure 2C) and, to a lower extent, inside the digestive tubules (Figure 2D) and in the intestinal epithelium. Figure 2. Polarized-light microscopy images showing the presence of microplastic particles in hemolymph (A), gills (B), gut lumen and epithelium (C), digestive tubules (D). Immunological responses of hemocytes exhibited statistically significant variations (Figures 3–C, Table 2). A significant destabilization of lysosomal membrane stability was observed in mussels exposed to various treatments (Figure 3A, Table 2); post-hoc comparison revealed a marked effect of BaP and LDPE-BaP after 7 and 14 days of exposure, while no differences were obtained among different treatments after 28 days (Figure 3A). Phagocytosis exhibited significant changes as a function of treatment and time, with a temporary increase after 7 days in mussels exposed to virgin polymer and to BaP alone, while a significant decrease appeared at longer times in all experimental conditions (Figure 3B, Table 2). Granulocytes-hyalinocytes ratio was significantly affected by treatment with marked increase caused by with BaP after 7 and 14 days, while no effects were observed in mussels exposed to both virgin and contaminated LDPE (Figure 3C, Table 2): after 28 days no differences were observed between exposed and control groups (Figure 3C). Figure 3. Immunological biomarkers in mussels exposed for 7, 14, and 28 days to various treatments (CTRL, control; LDPE, virgin low density polyethylene; BaP, benzo(a)pyrene alone; LDPE-BaP, benzo(a)pyrene-contaminated polyethylene). NRRT: neutral red retention time (A), Phagocytosis (B), Granulocytes/Hyalinocytes ratio (C). Data are expressed as mean values ± standard error, n = 4; different letters indicate significant differences between groups of means within the same time of exposure (post-hoc Newman-Keuls comparison). Acetylcholinesterase showed significant effects as a function of time with a slight decrease in hemolymph and a slight increase in gills after 7 days of exposure to all the treatments (Figures 4A,B, Table 2): no significant variations were observed between different treatments (Table 2). Figure 4. Biomarkers in mussels exposed for 7, 14, and 28 days to various treatments (CTRL, control; LDPE, virgin low density polyethylene; BaP, benzo(a)pyrene alone; LDPE-BaP, benzo(a)pyrene-contaminated polyethylene). ACh-E: acetylcholinesterase in haemolymph (A) and gills (B); DNA TAIL %: fragmentation of DNA (C); MN/1000: frequency of micronuclei (D); AOX: Acyl CoA Oxidase (E); Neutral Lipids (F). Data are expressed as mean values ± standard error, n = 4; different letters indicate significant differences between groups of means within the same time of exposure (post-hoc Newman-Keuls comparison). DNA strand breaks in hemocytes were always comparable for various treatments and times of exposure (Figure 4C, Table 2), while micronuclei showed a significant increase in mussels exposed to BaP and BaP contaminated LDPE after 14 days of exposure (Figure 4D, Table 2). 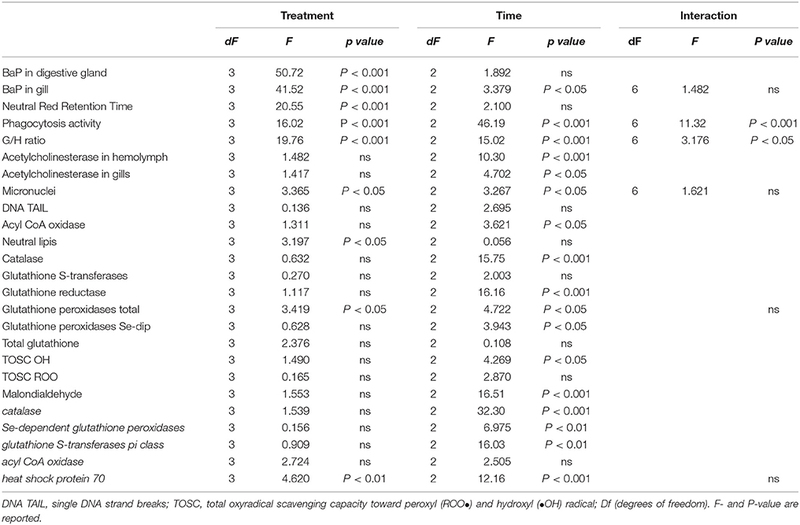 Peroxisomal AOX did not significantly vary in any treatments, although a clear trend of inhibition was observed over time in mussels exposed to LDPE (Figure 4E, Table 2). A slight increase of neutral lipids was observed in mussels exposed to BaP and BaP contaminated microplastics particularly after 7 days (Figure 4F, Table 2). Antioxidant defenses revealed minor fluctuations caused by various treatments, with only a slightly higher oxidative pressure after 28 days of exposure to BaP (Figures 5A–F, Table 2). The limited pro-oxidant challenge was further supported by MDA, showing a moderate increase only after 7 days in mussels exposed to LDPE and BaP (Figure 5I), and by general lack of variations for TOSC toward both peroxyl and hydroxyl radicals (Figures 5G,H, Table 2). Figure 5. 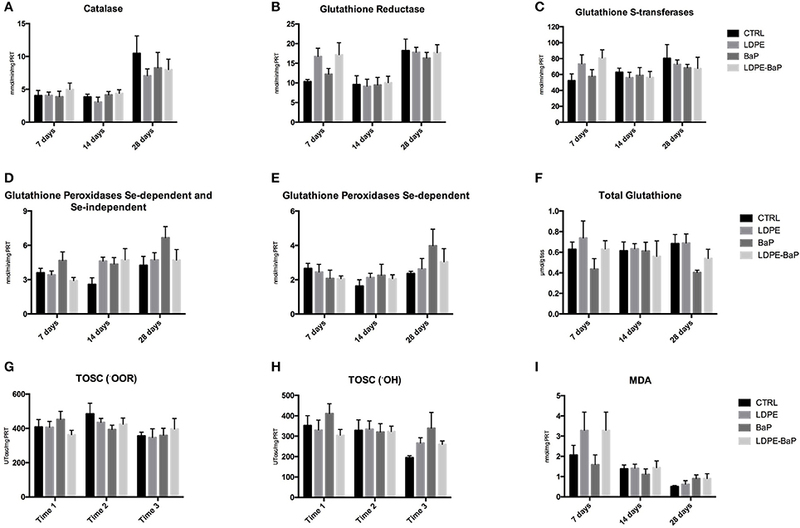 Levels of catalase (A), glutathione reductase (B), glutathione S-transferases (C), sum of Se-dependent and Se-independent glutathione peroxidases (D), Se-dependent glutathione peroxidases (E), total glutathione (F), total oxyradical scavenging capacity (TOSC) toward peroxyl (•OOR) radicals (G), total oxyradical scavenging capacity (TOSC) toward hydroxyl (•OH) radicals (H), malondialdehyde (MDA) (I) in mussels exposed for 7, 14, and 28 days to various treatments (CTRL, control; LDPE, virgin low density polyethylene; BaP, benzo(a)pyrene alone; LDPE-BaP, benzo(a)pyrene-contaminated polyethylene). Data are expressed as mean values ± standard error, n = 4; different letters indicate significant differences between groups of means within the same time of exposure (post-hoc Newman-Keuls comparison). The results on molecular analyses confirmed the absence of statistically significant differences between treatments on mRNA levels of antioxidants cat, gst-pi, Se-gpx, and of aox1 (Figures 6A–D, Table 2). Generally higher transcriptional levels were measured for cat and gst-pi in mussels after 28 days independently on exposure treatment, while fluctuating levels of Se-gpx mRNA were observed in mussels treated with BaP and with LDPE-BaP (Figures 6A-C, Table 2). 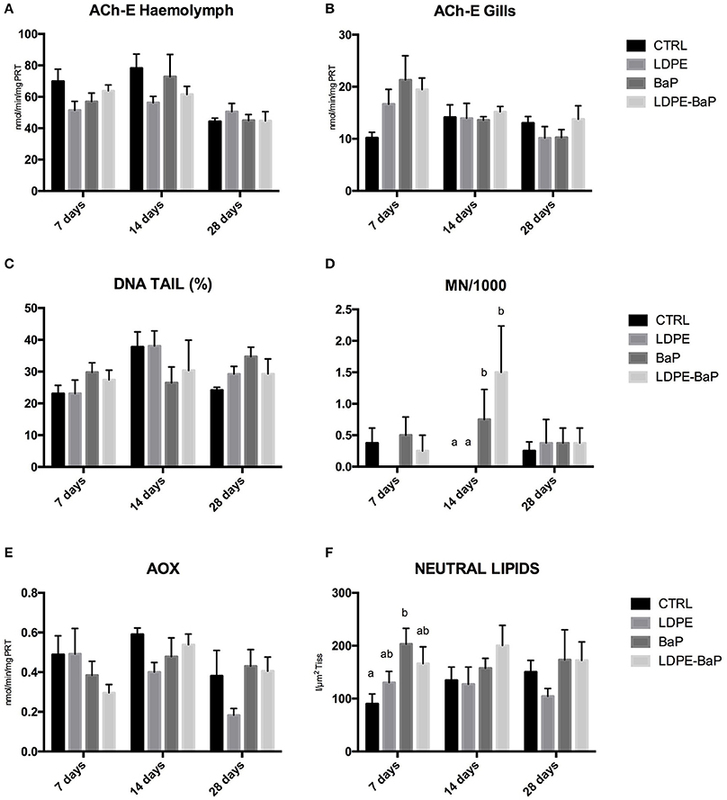 Transcriptional levels of hsp70 appeared downregulated by various treatments after 7 days, while a significant increase was observed in organisms exposed to LDPE for 14 days (Figure 6E). Figure 6. Transcriptional responses in the digestive glands of mussels exposed for 7, 14, and 28 days to various treatments (CTRL, control; LDPE, virgin low density polyethylene; BaP, benzo(a)pyrene alone; LDPE-BaP, benzo(a)pyrene-contaminated polyethylene). cat, catalase (A); gst-pi, pi-class glutathione S-transferase (B); Se-gpx, selenium-dependent glutathione peroxidase (C); aox1, acyl-CoA oxidase, isoform 1 (D); hsp70, heat shock protein 70 (E). Data are expressed as mean values ± standard error, n = 4; different letters indicate significant differences between groups of means within the same time of exposure (post-hoc Newman-Keuls comparison). The PCA carried out on the whole set of biomarkers produced a two-dimensional pattern explaining 54% of total variance (Figure 7). Although a quite large percentage remained to be explained, obtained results indicated a clear separation between specimens exposed at different treatments for different times. After 7 days (Blu ellipse), LDPE and LDPE-BaP treated mussels separated from the other groups, at 14 days (Red ellipse) mussels treated with BaP and LDPE-BaP were more differentiated, while after 28 days (Green ellipse) the effects of BaP alone became more evident, producing a clear separation between such experimental group and other treatments (Figure 7). The parameters determining the separation along the PC1 axis were related to immune system responses (G/H ratio), neurotoxic effects (AchE), and antioxidant system (catalase, glutathione-S-transferase, glutathione reductase, glutathione peroxidase Se-dep, TOSC •OH and ROO•), and AOX. On the other side, genotoxic effects (micronuclei), neutral lipids (NL), total glutathione (TGSH), total glutathione peroxidases (GPX_CHP), and phagocytosis activity determined the separation along the PC2 axis. Figure 7. Multivariate PCA analysis on biomarker data in mussels exposed to various microplastics treatments: CTRL, control; LDPE, virgin low density polyethylene; BaP, benzo(a)pyrene alone; LDPE-BaP, benzo(a)pyrene-contaminated polyethylene. Elaboration of data with weighted criteria summarized as Severe the hazard index for bioavailability in mussels exposed to BaP or BaP contaminated LDPE at all exposure periods (Figure 8). On the other hand, based on the magnitude of variations exhibited by various biomarkers, their statistical significance of such differences and the toxicological relevance of each biological endpoint, the model summarized the hazard for cellular responses as Slight for organisms exposed to BaP, virgin, and contaminated LDPE, and Moderate only for organisms exposed to BaP after 14 days (Figure 8). The integration of hazard indices elaborated for bioavailability and biomarker data resulted in a combined WOE effect classified as Slight for mussels exposed to virgin LDPE and Major for those treated with both contaminated LDPE and BaP alone, without variations at different times of exposure. Figure 8. Weighted elaboration of bioaccumulation and biomarkers data in mussels exposed for 7, 14, 28 days to LDPE, BaP, and LDPE-BaP. The assigned classes of hazard are given. Treatments: LDPE, virgin low density polyethylene; BaP, Benzo(a)pyrene alone; LDPE-BaP, Benzo(a)pyrene-contaminated polyethylene. The increase of plastics and microplastics in marine ecosystems has raised concern on their impact to marine organisms, and several species have been shown to ingest these particles under experimental and wild conditions (Cole et al., 2011; Lusher et al., 2013; De Witte et al., 2014; Avio et al., 2015, 2017b; Devriese et al., 2015; Paul-Pont et al., 2016; Sussarellu et al., 2016; Murphy et al., 2017). The capability of microplastics to efficiently adsorb chemical pollutants from the environment (Avio et al., 2017a) poses an additional risk although there is not yet clear evidence that microplastics ingestion has adverse consequences on the health status of marine species, especially under long term conditions. In this respect, the present study was aimed to provide new insights on the capability of microplastics to transfer adsorbed pollutant to organisms after ingestion and to evaluate potential ecotoxicological effects of virgin and contaminated microplastics, using the Mediterranean mussel M. galloprovincialis as model marine organism. Although the selected level of microplastics (10 mg/L) appears higher than environmental data, it is worthy to note that a direct comparison between experimental and field values is not necessarily appropriate. Reported seawater concentrations are typically referred to microplastics >200 μm, while natural levels are still unknown for smaller particles, like those used in the present study (20–25 μm), which represent the size range preferentially ingested by filter feeding organisms. Considering the need to characterize the ecotoxicological potential of such biologically relevant microplastics, at the present state of knowledge, concentrations of few mg/L are still in an ecologically relevant range to evaluate in laboratory conditions the disturbance of cellular pathways, possibly involved in long-term responses to small microplastics. Our results revealed that microplastics can act as efficient vehicles of chemical pollutants. Bioaccumulation analyses showed a marked and rapid enhancement of BaP concentrations in digestive gland of mussels exposed to LDPE-BaP, reaching a steady state after 7 days and values comparable to those observed in BaP treated mussels. This result corroborates the hypothesis of a marked release of BaP from microplastics and an elevated bioconcentration process in tissues under physiological gut conditions, as previously suggested by other authors (Teuten et al., 2009; Bakir et al., 2014; Avio et al., 2015). A slightly different trend was observed for bioaccumulation of BaP in gills: LDPE-BaP treated mussels exhibited only a moderate increase during the initial phases of exposure, reaching tissue concentrations similar to those observed in BaP exposed mussels only after 28 days. While a rapid uptake in gills can be explained by the direct contact of this tissue with the chemical dissolved in water (Banni et al., 2017), the slower accumulation from contaminated microplastics may, at least partly derive from primary desorption of BaP in digestive tissues and a secondary transfer of this chemical to gills. The possibility that BaP measured in LDPE-BaP treated organisms can reflect the presence of still un-excreted particles more than a real tissue accumulation, can be considered as negligible. Concentrations higher than 15 and 30 ng/g were measured in gills and digestive glands, respectively; assuming that all the measured BaP was still adsorbed on microplastics, we should expect at least 1 mg of particles for each gram of gill tissue (corresponding to 2.34 * 105 particles), and at least 2 mg (4.68 * 105 particles) for each gram of digestive gland. A similar assumption is excluded by histological analyses that confirmed the presence of particles in those tissues, but with much more limited numbers, particularly in gills where only a few and sparse microplastics were observed. Uptake and tissue distribution of microplastics has already been investigated in marine bivalves such as the mussels Mytilus edulis and M. galloprovincialis exposed to virgin and contaminated polyethylene and polystyrene (Browne et al., 2008; Von Moos et al., 2012; Avio et al., 2015). Although these studies used extremely high concentrations of microplastics (up to three order of magnitude greater than in the present work), they were important in demonstrating the initial uptake of particles at the gill's surface through microvilli activity and endocytosis, while via ciliae movement in the stomach, intestine and digestive tubules are responsible for a second pathway mediated by accumulation within the lysosomal compartment (Von Moos et al., 2012). Our observations almost reflected the above mechanisms of uptake, with aggregates of particles observed within intestinal lumen and digestive tissues, lower occurrence in gills, and some particles noticed also inside hemocytes, as previously documented in other experiments (Browne et al., 2008; Von Moos et al., 2012). Histological analyses were of qualitative nature, but no marked differences in the amount of microparticles were visible for various treatments and times of exposure, thus supporting a short retention time of such particles in mussels, as reported in fish exposed to microbeads (Grigorakis et al., 2017). Significant immunological effects were observed on hemocytes lysosomal membrane stability, phagocytosis, and granulocytes/hyalinocytes ratio. The impairment of immune system has already been measured in marine organisms exposed to microplastics by several authors (Von Moos et al., 2012; Avio et al., 2015; Paul-Pont et al., 2016). Lysosomes, beside representing major sites for intracellular sequestration and detoxification of xenobiotics, have been also demonstrated as sensitive organelles toward micro- and nano-plastics (Regoli, 1992; Petrović et al., 2004; Moore et al., 2006; Canesi et al., 2012; Avio et al., 2015; Nardi et al., 2017). The destabilization of lysosomal membrane caused by LDPE or BaP alone, was synergistically enhanced in mussels exposed to LDPE-BaP, particularly after 7 days and, to a lower extent, 14 days of exposure. Effects of various treatments were observed also for phagocytosis which initially increased in mussels exposed to LDPE and BaP, while decreasing at longer periods as a consequence of BaP, virgin, and contaminated LDPE: similar effects might be due to an overload of sequestering capacity of hemocytes by microplastics, and to the well-known inhibitory action of PAHs on this function (Wootton et al., 2003; Hannam et al., 2010). Interestingly, LDPE and LDPE-BaP did not affect the granulocytes/hyalinocytes ratio that was statistically increased only by BaP until 14 days. The changes of immune parameters observed in this study are not a surprise given the characteristics of plastic particles, and the physical stress that potentially induce in hemocytes, further modulated with a chemical challenge in mussels exposed to LDPE-BaP. Our results did not reveal significant effects on AChE activity neither in hemolymph nor in gills, although both the tissues exhibited after 7 days a clear trend toward reduced or enhanced values, respectively. The only moderate and temporary modulation of AChE may reflect the low exposure period. However, cholinesterasic effects of microplastics still deserve scientific attention due to the abundance of these particles in the marine environment and their suggested role in influencing various physiological and behavioral responses controlled by neurological mechanisms (Oliveira et al., 2013; Avio et al., 2015; Mattsson et al., 2017; Ribeiro et al., 2017). No variations were measured on levels of DNA strand breaks in organisms exposed to microplastics (both virgin and contaminated) or to BaP. A high DNA fragmentation had been previously measured in mussels exposed to polyethylene microplastics (Avio et al., 2015), but the more elevated amount of particles used in those treatments (1.5 vs. 0.01 g/L of this study) can explain the different results. Similarly, the lack of DNA fragmentation in BaP treated mussels might reflect the low experimental concentration as compared to those frequently used for assessing ecotoxicological effects of BaP in mussels (Pan et al., 2009; Banni et al., 2017): in this respect, no formation of DNA adducts or strand breaks was observed in mussels exposed to 300 ng/L of BaP for 24 days (Ching et al., 2001). Some authors have suggested that microplastics ingestion can potentially cause pseudo-satiety in mussels, thus lowering fatty acids metabolization (Kühn et al., 2015). The AOX, one of the enzymes involved in fatty acid oxidation (Cajaraville et al., 1997; Bilbao et al., 2009) did not show significant effects neither at catalytic nor at transcriptional levels. Content of neutral lipids tended to increase in mussels exposed to BaP and LDPE-BaP, confirming a typical effect of this chemical in inducing lipidosis in digestive gland of mussels (Livingstone and Farrar, 1984; Gorbi et al., 2008). Treatments with virgin and contaminated microplastics did not affect the oxidative status of mussels, and only minor fluctuations of a few enzymes (glutathione S-transferases and glutathione reductase) were observed, without clear trends as a function of treatment or time of exposure. Responses of antioxidant system were investigated also at molecular level, since transcriptional changes might be more sensitive than enzymatic biomarkers, despite more useful in revealing “exposure” rather than functional “effects” at cellular level (Giuliani et al., 2013; Regoli and Giuliani, 2014). Also these analyses exhibited minor and not significant variations, allowing to exclude an oxidative challenge, as further supported by the lack of effects on the total antioxidant capacity and peroxidation processes in mussels exposed to virgin and contaminated LDPE. The lower levels of particles used in this study, might explain the different results on oxidative effects in comparison to other studies in which mussels exposed to microplastics exhibited significant changes of antioxidant defenses (Avio et al., 2015; Paul-Pont et al., 2016; Détrée and Gallardo-Escárate, 2017; Ribeiro et al., 2017). A transient upregulation of hsp70 was observed only after 14 days in mussels exposed to virgin LDPE, suggesting a response toward the physical disturbance caused by the ingestion of such particles. Enhanced levels of these proteins are a generic biomarker of stress, acting in mussels as a first line of defense to cope with environmental challenges (Franzellitti and Fabbri, 2005; Heindler et al., 2017). The effects of contaminated microplastics were more similar to those of BaP, with lack of statistical changes and a trend toward lower values of hsp70, supporting a limited responsiveness of these proteins to the prevalence of a chemical stress. The overall evaluation of biomarker results by multivariate PCA provided a clear separation between times and typologies of exposure, highlighting a shift from a physical to a chemical stress. After 7 days, the main effects were those induced by microplastics (possibly reflecting a physical challenge), followed at 14 days by those combined of microplastics with BaP, while at longer exposure conditions effects of BaP prevailed on those induced by microplastics (chemical impact). The multivariate analysis indicated that the majority of observed immunological, lysosomal, and cholinesterasic effects were influenced by polymer (LDPE), while genotoxicity and antioxidant defenses were mostly related to BaP. The impact of LDPE-BaP appeared more biologically relevant with time of exposure, suggesting that energy resources were initially directed to activate primary mechanisms of defense toward the physical stress of particles, while later the chemical stress assumed the major role in biological disturbance. A similar delay of chemical-induced toxic effects was previously observed in fish Pomatoschistus microps exposed to microplastics and organic compounds, where these particles acted as a transitory mechanism of protection toward chemical insult (Oliveira et al., 2013). The overall data were elaborated according to the weighted criteria of the Sediqualsoft model to synthesize the biological significance of bioaccumulation results and cellular responses in mussels exposed to virgin and contaminated microplastics. The bioavailability of BaP was classified as Severe for both the chemical dosed alone and for LDPE-BaP, since concentrations increased from 15- to 60-folds in tissues of exposed mussels compared to controls. On the other hand, the toxicological hazard calculated from the number, magnitude and biological importance of biomarkers was typically Slight for all the treatments, raising to Moderate only in BaP exposed mussels after 14 days. The combination of chemical and cellular hazards provided a WOE index Slight for mussels exposed to virgin LDPE, and Major for those exposed to BaP and LDPE-BaP for all the periods. Considering the similarity of biological effects observed after 28 days, it is quite obvious that the final evaluation of the risk caused by virgin and contaminated LDPE was greatly influenced by the marked accumulation of BaP, further corroborating the still unexplored possibility of indirect, long-term consequences of released chemicals. In conclusion, this study confirmed that microplastics can transfer adsorbed organic contaminants like BaP to tissues of marine organisms, providing an additional experimental evidence to the role of these particles as source of chemical bioaccumulation. Both virgin and contaminated microplastics did not induce marked ecotoxicological effects at molecular and cellular levels after 28 days of exposure. However, the observed susceptibility of the immune system, the accumulation of BaP and the probable shift from physical to chemical challenge, suggest that the toxicological risk of microplastics for marine organisms is probably low, but not negligible. Additional studies are needed to elucidate conditions of chronic exposure and whether interactions of particles with other stressors may provoke long term, subtle effects on organisms' health status. The study was exempt from the above requirements because they do not apply to invertebrates which were used in this study. LP, CA, SG, and FR: Conceived the study; SK and BC: Prepared the contaminated microplastics; LP and CA: Performed the experiments; LP, CA, and MG: Made laboratory analyses, GdE: Statistical and weighted elaboration of data; LP, CA, SG, and FR: Wrote the manuscript, FR: Edited and reviewed the final version of the manuscript which all the authors approved before submission. This work has been financially supported within Ephemare Project (by JPI Oceans). Centro Assistenza Ecologica (Ancona) partially funded the Ph.D. fellowship to LP. Browne, M. A. (2015). “Sources and pathways of microplastics to habitats,” in Marine Anthropogenic Litter, eds M. Bergmann, L. Gutow, and M. Klages (London: Springer), 229–244. Galgani, F., Hanke, G., and Maes, T. (2015). “Global distribution, composition and abundance of marine litter”, in Marine Anthropogenic Litter, eds M. Bergmann, L. Gutow, and M. Klages (London: Springer), 29–56. Gilfillan, L. R., Ohman, M. D., Doyle, M. J., and Watson, W. (2009). Occurrence of plastic micro-debris in the Southern California Current system Cal. Coop. Ocean. Fish. 50, 123–133. Kühn, S., Bravo Rebolledo, E. L., and van Franeker, J. A. (2015). “Deleterious effects of litter on marine life,” in Marine Anthropogenic Litter, eds M. Bergmann, L. Gutow, and M. Klages (London: Springer), 75–116. Livingstone, D. R., and Farrar, S. V. (1984). Tissue and subcellular distribution of enzyme activities of mixed-function oxygenase and benzo[a]pyrene metabolism in the common mussel Mytilus edulis L. STOTEN 39, 209–235. Lusher, A. (2015). “Microplastics in the marine environment: distribution, interactions and effects,” in Marine Anthropogenic Litter, eds M. Bergmann, L. Gutow, and M. Klages (London: Springer), 245–307. Rochman, C. M. (2015). “The complex mixture, fate and toxicity of chemicals associated with plastic debris in the marine environment,” in Marine Anthropogenic Litter, eds M. Bergmann, L. Gutow, and M. Klages (London: Springer), 117–140. Thompson, R. C. (2015). “Microplastics in the marine environment: sources, consequences and solutions,” in Marine Anthropogenic Litter, eds M. Bergmann, L. Gutow, and M. Klages (London: Springer), 185–200. Copyright © 2018 Pittura, Avio, Giuliani, d'Errico, Keiter, Cormier, Gorbi and Regoli. This is an open-access article distributed under the terms of the Creative Commons Attribution License (CC BY). The use, distribution or reproduction in other forums is permitted, provided the original author(s) and the copyright owner are credited and that the original publication in this journal is cited, in accordance with accepted academic practice. No use, distribution or reproduction is permitted which does not comply with these terms.